Yoga On Tap is a weekly community yoga class in Charlotte, NC every Tuesday night from 6:30-7:30pm at The Olde Mecklenburg Brewery, voted "Best Brewery in CLT" by Charlotte Magazine. Each week there's a different teacher leading the class from a variety of Charlotte yoga studios, offering a different style of yoga. We have teachers from out-of-state as well bringing a new yoga flare from different parts of the country. 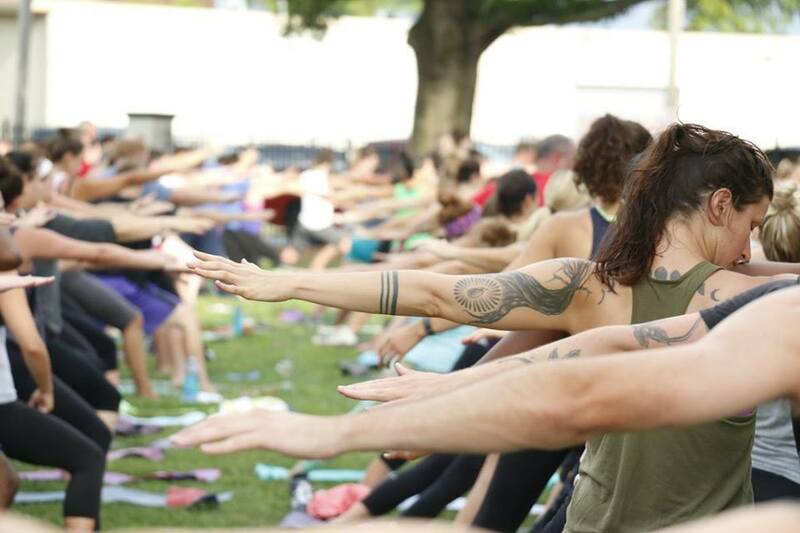 Hundreds of people come together to do yoga at this amazing venue and mingle while enjoying a cold, award-winning OMBrew. Our yoga classes raise awareness for dozens of causes, non-profits, sports teams, the arts and other Charlotte organizations. Classes are $8 and includes an OMBrew or soda. Get there early and park in the OMB parking lot. Bring your mat and plan to hang out afterwards in the brewery. The yoga class is year-round and is held indoors in the winter. This powerful community movement has led to a creative line of yoga clothes and jewelry that's guaranteed to make you smile. Shop online or find Yoga On Tap jewelry in select retail stores across the east coast. A portion of the proceeds goes to St. Jude Children's Research Hospital. Check us out on Facebook & Instagram and see for yourself the power of yoga, beer, community and giving back!